I’m taking an extended hiatus from writing, I recently got a tablet for drawing, and thought some of you might like to see my art. 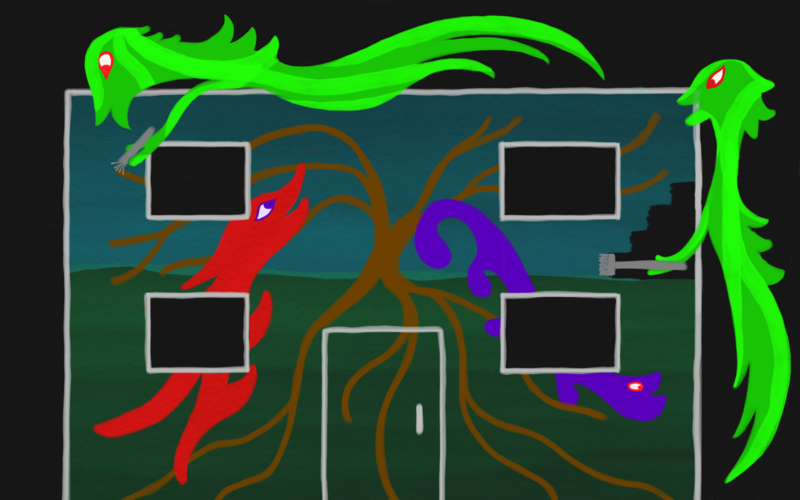 In this one, happy monsters climb a tree at night, with a blue crescent moon in the sky. If you like this art, you can get it at Redbubble on T-shirts, coffee mugs, tote bags, and other swag. (Note: I’ve changed the way I’m creating these arts, the new ones on Redbubble have a transparent background so the art shows uo better.) Or you can just enjoy it. 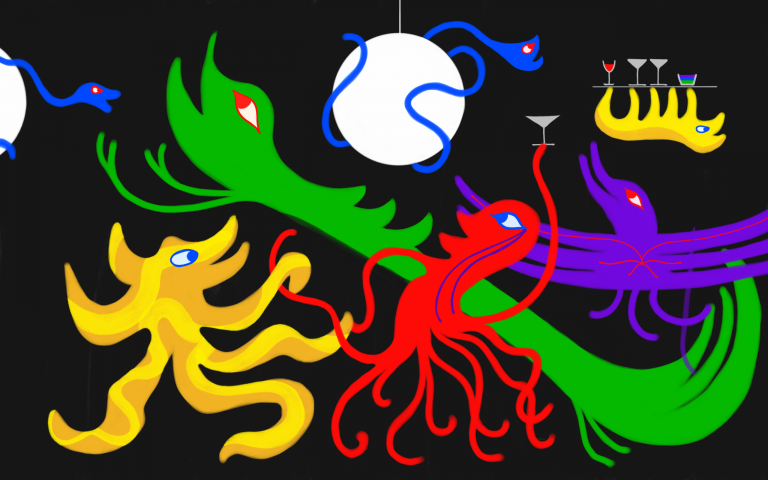 I’m taking an extended hiatus from writing, I recently got a tablet for drawing, and thought some of you might like to see my art. 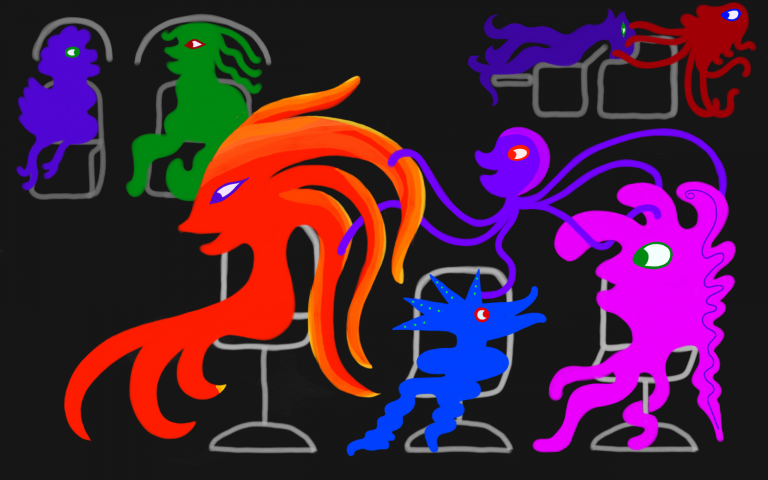 In this one, happy monsters in the beauty parlor get their hair done. Tentacles. Whatever. If you like this art, you can get it at Redbubble on T-shirts, coffee mugs, tote bags, and other swag. Or you can just enjoy it. I’m taking an extended hiatus from writing, I recently got a tablet for drawing, and thought some of you might like to see my art. 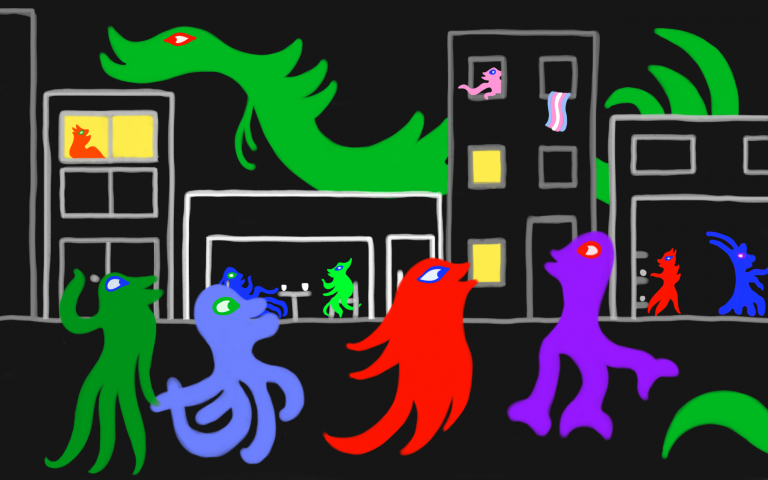 In this one, happy monsters socialize on a city street at night; shopping, chatting in a cafe, or just enjoying the evening air. A huge dragon monster flies behind the buildings, looking out over the whole street. I’m taking an extended hiatus from writing, I recently got a tablet for drawing, and thought some of you might like to see my art. In this one, happy monsters read and relax by a fireplace in a library; a dragon monster sits on a shelf, knocking books off to reach one. Click the pic to see full size. I’m taking an extended hiatus from writing, I recently got a tablet for drawing, and thought some of you might like to see my arts. Click the pic to see full size. 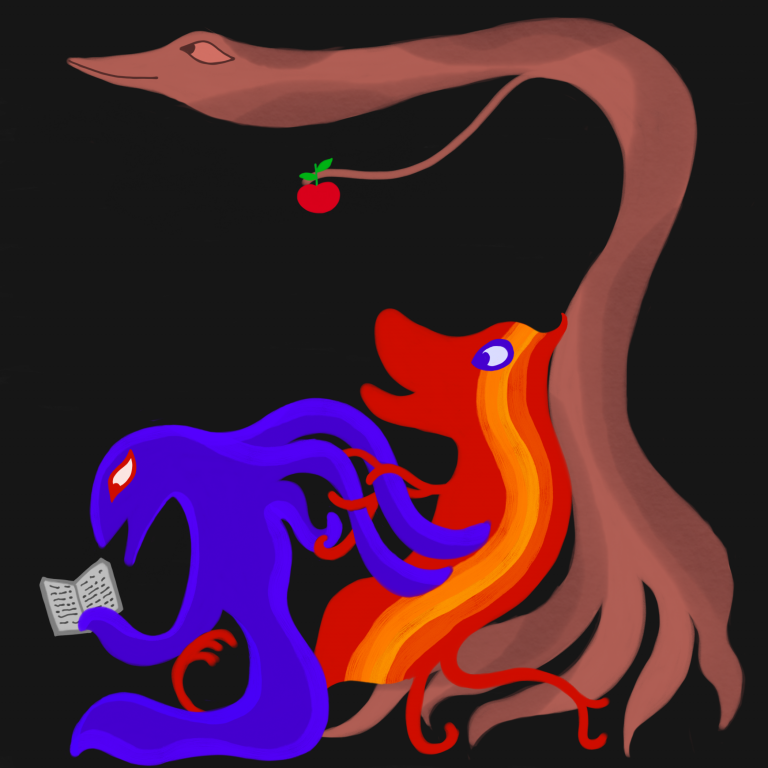 Image description: In this one, two happy monsters are snuggling under a tree: one is reading, the other is braiding the first one’s hair. Tentacles. Whatever. 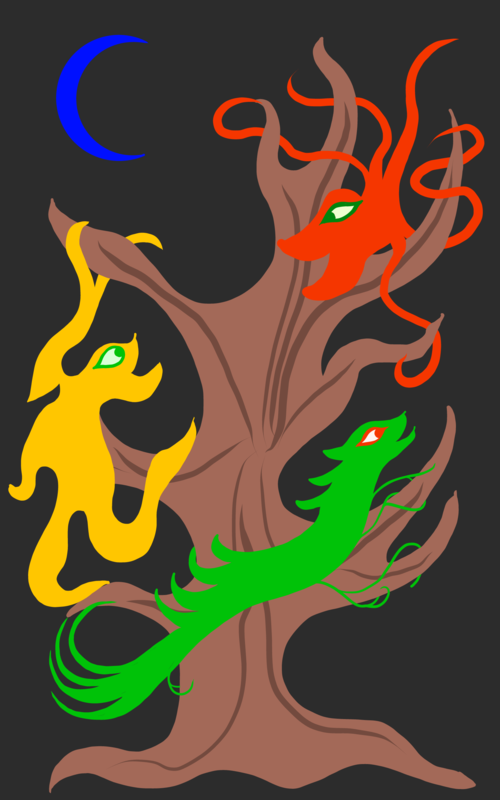 They’re under a tree with the head of a snake, which is offering them an apple. If you like this art, you can get it at Redbubble on T-shirts, coffee mugs, tote bags, and other swag. Or you can just look and go, “Oooo.” Enjoy! I’m taking an extended hiatus from writing, I recently got a tablet for drawing, and thought some of you might like to see my arts. Here’s a very meta one: a drawing of happy monsters painting a mural, which depicts different happy monsters. Click the pic to see full size. I’m taking an extended hiatus from writing. I recently got a tablet for drawing, and I thought some of you might like to see my arts. 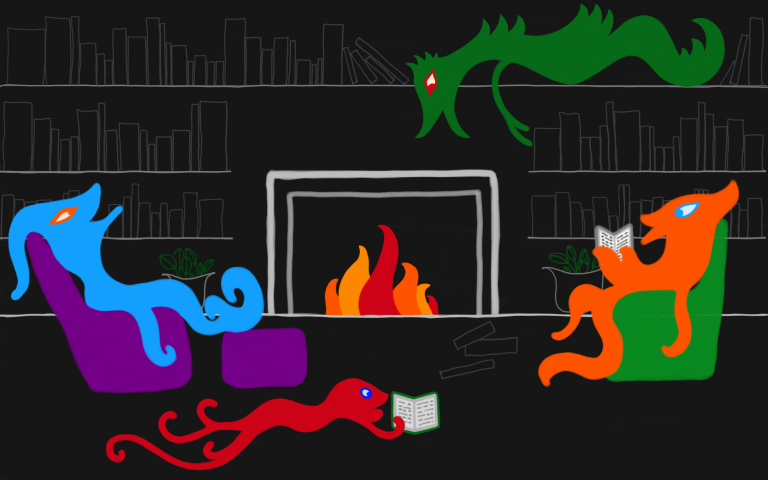 Here’s a drawing of happy monsters watching TV together. Click the pic to see full size. I’m taking an extended hiatus from writing. I recently got a tablet for drawing, and I thought some of you might like to see my arts. 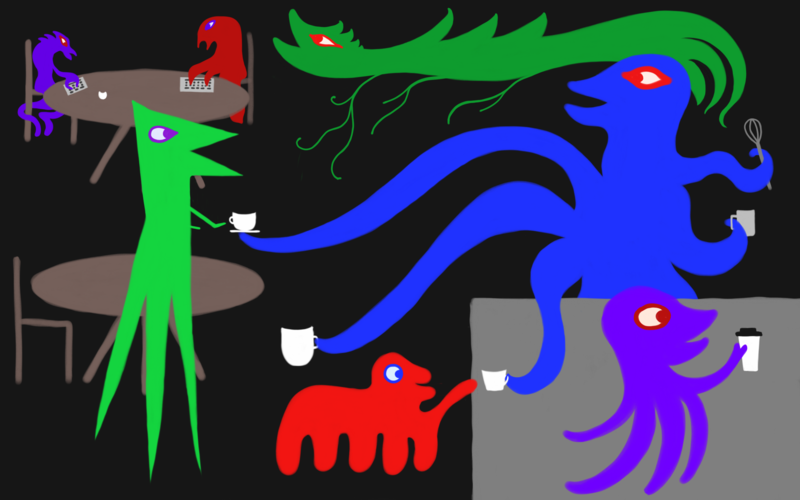 Here’s a drawing of happy monsters in a cafe. Click the pic to see full size. I’m taking an extended hiatus from writing. I recently got a tablet for drawing, and I thought some of you might like to see my arts. 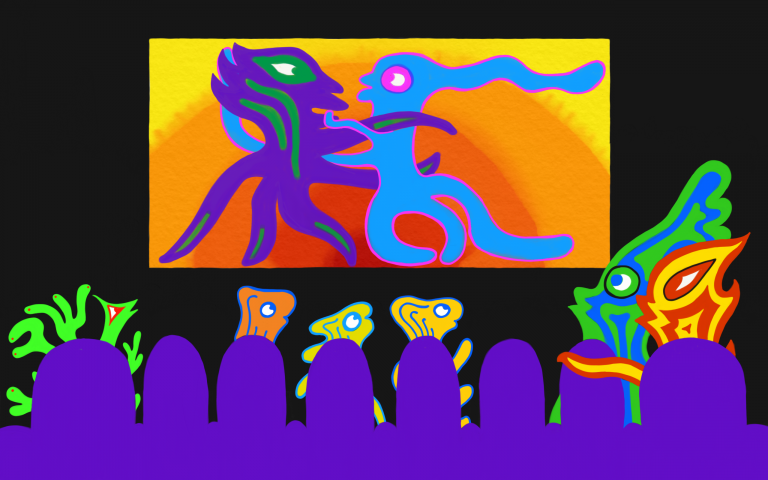 Here’s a drawing of happy monsters at the movies. Click the pic to see full size. I’m taking an extended hiatus from writing. 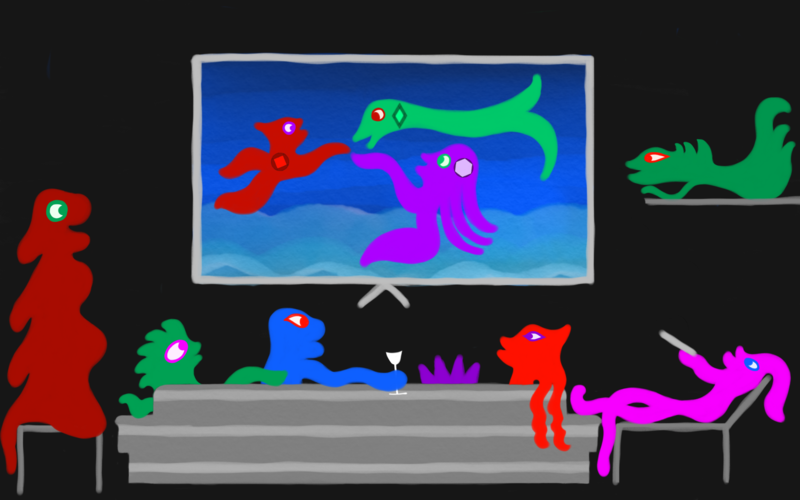 I recently got a tablet for drawing, and I thought some of you might like to see my arts. Here’s a drawing of happy monsters dancing in a nightclub. Click the pic to see full size.